RCP 8.5: The "Mother of all" Junk Climate Science | Watts Up With That? Nearly every catastrophic global warming doomsday scenario, particularity those involving icecap failures and Noah-size sea level rises are based on the “RCP 8.5” scenario. 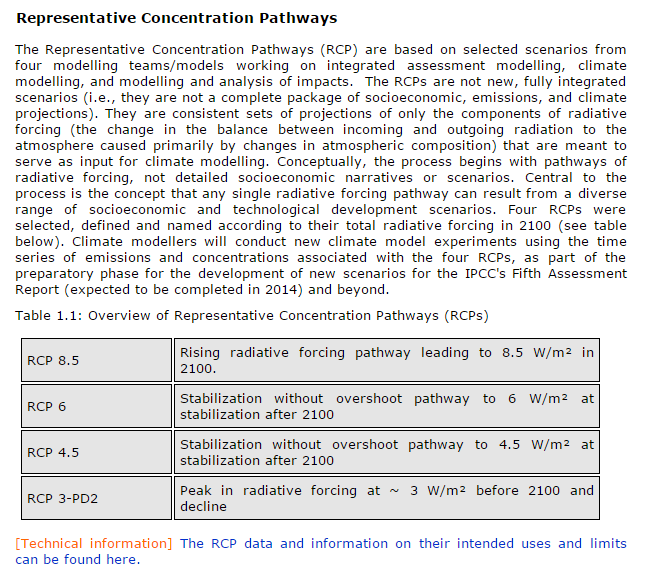 Representative Concentration (or Carbon)Pathway 8.5 assumes a “rising radiative forcing pathway leading to 8.5 W/m² in 2100.” It is generally assumed, with little dissent, that each doubling of the atmospheric CO2 concentration will add 3.7 W/m² to the net infrared radiative flux. Note: Yes. The above is from SkepSci. I checked the math. It’s close enough. Figure 1. 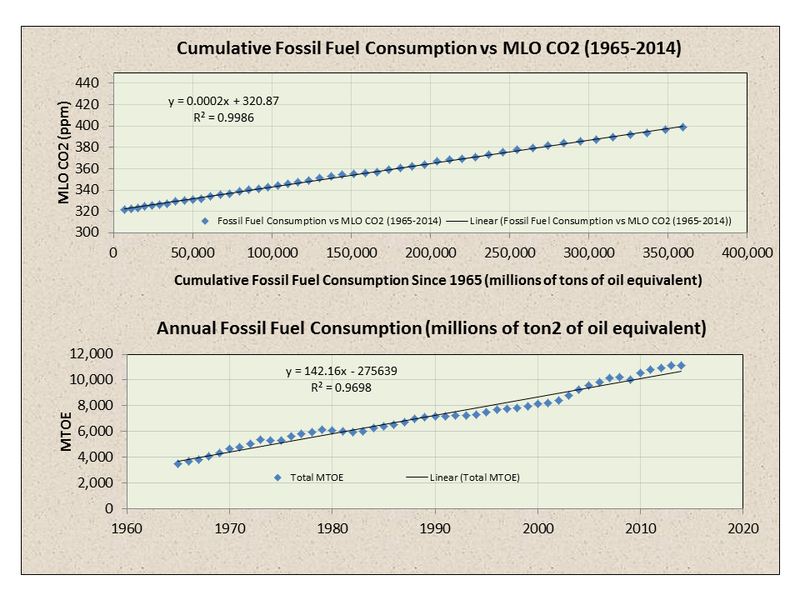 Cross-plots of (top) cumulative fossil fuel consumption (MTOE) vs. atmospheric CO2 (ppm) as measured by the Mauna Loa Observatory (MLO) and (bottom) annual fossil fuel consumption (MTOE) vs time. Note: MTOE = Millions of Tonnes of Oil Equivalent. Note to nitpickers: Yes, I know the top and bottom charts and equations 1 and 2 should have been listed in the opposite order. These two equations enable me to project fossil fuel use and atmospheric CO2 into the distant future (beyond my retirement date… which with oil at $30/bbl is either very far off in the future or sooner than I would prefer). Using the assumption that the mix of crude oil, natural gas and coal would remain at a constant ratio (that of the period 2005-2014), I come up with an atmospheric CO2 concentration of 683 ppm in 2100, about half of RCP 8.5 (Venus) and comparable to RCP 4.5 (non-catastrophic). Figure 2. GIGO is as GIGO does. I didn’t do the calculations for natural gas and coal… because I had to get back to work. My best guess is that there is more than enough coal and natural gas in the ground to make it to 2100 without us having to freeze in the dark. Disclaimer: These models are based on a whole lot of assumptions… But probably not nearly as many assumptions as RCP 8.5. It has been brought to my attention that RCP 8.5 references “CO2-equivalent,” not pure CO2 and that the CO2-only concentration in 2100 is posited to *only* be 930 ppm, not 1130. 930 is still a lot (36%) higher than 683… And 683 was based on the assumption that the ratio of crude oil, natural gas and coal remains constant. Since natural gas will very likely continue to displace coal and eventually crude oil, 683 is probably unrealistically high as well. Does any sane person really believe that the atmospheric CO2 concentration could rise from the current 400 ppm to 930 ppm over the next 85 years? Does any sane person really believe that the atmospheric CO2-equivalent concentration could rise from the current 478 ppm to 1,370 ppm over the next 85 years? Why would the non-CO2 GHG’s rise at a 25% faster rate than the already improbable RCP 8.5 rate for CO2? April 5, 2016 in Bad science, Carbon dioxide, Climate FAIL, Climate Models, Climate News, Coal, Energy, Humor, humour, IPCC, Modeling, natural gas, petroleum. Just curious, should “will” be replaced with “may”? i agree that since it is an assumption, and a general one at that, it would be better to use the expression ‘may’. I think that might be redundant… But, that’s an assumption… Maybe. I think we should demand “may or may not” in general. “It is generally assumed” is a statement. What follows is what the author believes is generally assumed. He believes that it is generally assumed that “CO2 concentration WILL add”. That is what the author is claiming is generally assumed. He is not making the claim that it is generally assumed that “CO2 concentration MAY add”. WILL and MAY have two different meanings. The author chose to use WILL so it is the meaning assigned to the word WILL that the author intends the reader to find in his statement. We must read what is there. Whether the author is right or wrong about what he is assuming does not change what the thing he is assuming is. It is generally assumed, with little dissent, that each doubling of the atmospheric CO2 concentration will add 3.7 W/m² to the net infrared radiative flux. “It is assumed” A will lead to B.
Eugene – you may be assuming that the author over thought the distinctions as much as you do. ‘May’ is iffy. ‘Will’ is unambiguous. The grammar is fine. The problem comes from the qualifier or lack thereof. There is no accepted formula that I am aware of for residence time of CO2 in the atmosphere or what happens at the interface of ocean and atmosphere under higher CO2 levels. These factors are likely to have a major impact on where CO2 levels get to. To make my point even clearer — The grammar of either line (using “will” or “may) is perfectly correct — but the meaning of the line is not the same. The author can assume either statement. He chooses to use “will”. The line used cannot be faulted on grammar. Nor could it be faulted on grammar if he had chosen to use “may” instead of “will”. If “It is generally assumed, with little dissent, that each doubling of the atmospheric CO2 concentration will add 3.7 W/m² to the net infrared radiative flux.” then the authors haven’t a clue what they are talking about. The change in radiation absorption with concentration is a logarythmic curve. The authors of this report do not consider that their conclusions are only supported by models assuming that increasing CO2 causes a temperature increase(despite increased CO2 lagging temperature change) and that the temperature increase caused by CO2 causes increased water vapor in the air- equilibrium climate sensitivity. ECS equation Ts / F = (6.1 IPCC AR3). 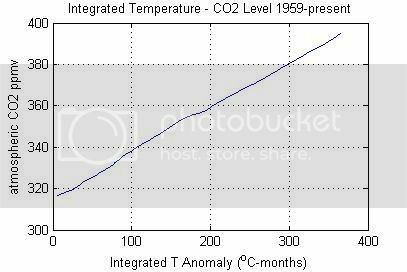 Regardless of the ECS value used, the CO2 absorption of energy is well along the logarythmic curve which does not support greatly increasing temperatures in the future. None of the models in use can explain how the earth has gone through dramatic changes in CO2 levels, orbital mechanics, ice ages, and warm periods but the actual climate temperature has stayed within a very narrow range of 278K +/- 3K. The earth obviously has many interacting factors that keep it’s climate in a very stable range that are not considered or calculated in any modeling. … doubling CO2 adds 3.7W as such, but then there are feedbacks, so the end result we don’t know. I guess the 8.5W is based partly on assumption of large positive H2O feedback. Feedbacks are not part of the radiative forcing. They are factored into the ECS and TCR (how the radiative forcing translates to temperature change). The problem with climate scientists is that they do not have any quantitative basis for such statements. The value of 3.7W is not based on evidence, nor are the feedbacks built into the climate models. As David Middleton points out, climate scientists wrap these non-evidence based factors into terms they label as ECS (Effective Climate Sensitivity) and TCR (Transient Climate Response). Defining and labelling must therefore make them real. The results indicate that doubling of atmospheric CO2 only results in 2.4W/m2 additional absorption of terrestrial radiation, which means that a doubling of atmospheric CO2 will result in an increase of 1.2% of total absorption. “Will” is correct. Definite assumptions are used for forecasting. Uncertainty is incorporated in the fact that it is an assumption. That’s the way I view it. Nice simple engineering approach. When you find more oil and gas I’m keen to help develop it! There doesn’t seem to be that much conventional light, medium, and heavy oil left to be found. I’m afraid we are also seeing reserves destruction in Venezuela’s Orinoco oil belt (due to poor practices/mismanagement). There may be additional unconventional oil resources, to be found in very low permeability rocks. But that oil will be very expensive. More likely from very heavy oil/tar deposits like the Athabasca Oil sands dontcha think? Looks to me like what’s actually going on in Alberta is a sort of conversion of cheap natural gas — which powers the operation — into expensive, but more convenient, oil. I’m told that there are a LOT of BTUs worth of sludgy hydrocarbons in Alberta and Venezuala (And probably, it’ll turn out, elsewhere). I’m an optimist who expects hydrocarbon use in developing countries to soar further and faster than most anyone anticipates because they need the power to bring their populations up to a reasonable standard of living. But I agree with David. There will be enough hydrocarbons to get the human race through this century comfortably. The 22nd century? Y’know what? Humanity is eventually going to need those non-carbon technologies to work and work well. Might be as soon as then. There is enough coal left for hundreds of years. And it will be hundreds of years before windmills make sense. Solar might be viable eventually. That means without subsidies. But take away subsidies from windmills and we’ll have thousands of non-working monuments to the gods of misallocation of resources. Aside from nuclear, there’s no better power source than fossil fuels. They’re the gold standard of inexpensive power production. Um No, dbstealy Solar is never going to work for this reason. There is 121 Million Square km of non polar land available 49 Million of which are used to produce food, allowing for the 30% increase in population and 20% to address the poverty gap results in a required cultivation area of around 75 Million square km leaving 55 Million – less 10 Million unsuitable sites, eg himalayas etc or shaded – down to 45 Million square km available. The area requirement for your mega solar farm is therefore 32/45 = 71% of the available earths remaining surface cleared and TILED with 11 Quadrillion 1m squared PV solar panels… How environmentally irresponsible would that be. Can you see how utterly impractical this is? bobl, I like your illustration of the area requirements associated with all all-solar world, but I think your assumptions lead to too high a level of energy consumption. Some authorities project the world population to peak around 9 billion by 2050 and gradually decline after that. The developing countries may catch up to today’s OECD level of income over the period to 2100, but I doubt that many economists are so optimistic as to believe they will entirely close the gap. In an increasingly urbanized world, transportation systems almost certainly will have to move partially away from individual vehicles for mass transportation to avoid gridlock, so your assumption about gasoline use is therefore probably far too high. Finally, a more realistic (but still extremely “optimistic”) share for solar energy in the global mix by 2100 might be 50%. If you were to develop an alternative scenario using more modest assumptions like these, how much land do you calculate would be required? Look Bob, if I halved it you would still need 40% of all non agricultural land, tiled with Quadrillions of panels. I still call bunkum on the idea that this is remotely doable, energy density by area is far too low. Solar power is impractical from an engineering point of view, the overbuild required to make it grid reliable makes it totally unwieldy. This is just simple Math. Neither are countries uniform in size, Just to replace Singapore’s 12.8GW of generation with reliable Solar would take 3000 odd square km of panels. Adding a similar capacity to replace liquid fuels and gas (electric cars and boilers) and you’d need around 6000 square km. Trouble is Singapore is only 719 Square km in size! How would you anticipate Singapore converts to solar? A question I ask to get warmists to talk science is “Why doesn’t CO2 fall out of the atmosphere when there is no sunshine?”. Here is another good question to ask warmists: How would the Sun have to do change to add (beyond what it does at peak versus minimum) 8.5 W/m2 to the atmosphere by 2100? added: In general terms, over the course of a single cycle component from high to low activity, TOA change in energy is about 0.2 W/m2, which translates into a buried in the noise change of a fractional hundreths of degrees in temperature. Now ramp that up in a proposed scenario whereby the Sun changes so much that it adds 8.5 W/m2 at its peak. 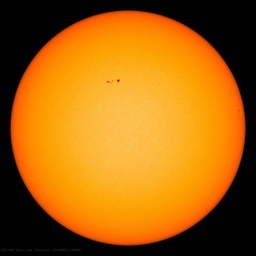 Given the unimaginable solar change necessary for that to occur, it calls into question the ability of something in the atmosphere measured in parts per million to do that. Correction, the swing is about 20 W/m^2, +10 to -10 around the mean. See “Atmospheric Moisture Transports from Ocean to Land and Global Energy Flows in Re-analyses” Trenberth et. al. 2011. Figure 10 is most interesting regarding uncertainties. Very good. Hope your retirement isn’t a lot sooner than you hoped. If there’s one thing an alarmist cannot be accused of, it’s being sane. I printed that out and hung it up on my office doorway… LOL!!! This entire “guesstimating” of “radiative forcing” shows that this entire GHG paradigm is not physics . It lacks either fundamental quantitative enabling equations or experimental demonstration of the “trapping” of thermal energy between a surface an a cascade of optical filters to a higher density than the radiant energy impinging on the sequence of filters . Pretty much everything beyond the basic black body radiation equations is based on assumptions and SWAG’s. Run the S-B equation at surface of 15 C and lower troposphere at -40 C. That T to the fourth makes a big difference. Plus have you seen an emissivity for CO2? From what I can tell it’s pretty much zero. Even black body radiation in terms of thermal equilibrium is now questioned due to some research by Pierre Marie Robitaille, and Kirchhoff’s theory seems to have been invalidated. Actually , I find very few who even understand that the “black body” temperature in our orbit is about 278.6 +- 2.3 from peri- to ap-helion ( assuming about a 5800 effective Sun temperature ) and that is the temperature of any gray body however light or dark . Any decrease from that value down to 255K as one enters the atmosphere has to be explained by the non-flat spectrum of the upper atmosphere . Even getting these basic computations experimentally reestablished and “settled” would be significant progress . Yes, “radiative forcing” is junk science. Radiative science is junk relative to GHG forcing, but not relative to solar forcing and this is what tends to confuse people who lean left as they tend to like ‘one size fits all’ kinds of solutions. IPCC AR5 Table 13.5 – RCP 8.5 has 0.74 (0.52 to 0.98) m sea level rise by 2100. IPCC AR5 Table 13.8 – RCP 8.5 takes until year 2500 for 1.51 to 6.63 m sea level rise. Earth’s carbon cycle contains 45,000 Gt (E15 gr) +/- 850 GT of stores and reservoirs with a couple hundred Gt/y +/- ?? ebbing and flowing between those reservoirs. (IPCC AR5 Fig 6.1) Mankind’s net contribution (dry labbed by IPCC to make the numbers work) to this bubbling, churning caldron of carbon/carbon dioxide is 4 Gt/y +/- 96%. (IPCC AR5 Table 6.1) Seems relatively trivial to me. IPCC et. al. says natural variations can’t explain the increase in CO2. With those levels of uncertainty how would anybody even know? Mankind’s alleged atmospheric CO2 power flux (watt is power, energy over time) contribution between 1750 and 2011 was 2 W/m2 of radiative forcing. (IPCC AR5 Fig SPM.5) Incoming solar RF is 340 W/m2, albedo RF reflects 100 W/m2 +/- 30 (can’t be part of the 333), 160 W/m^2 reaches the surface (can’t be part of the 333), latent heat RF from the water cycle’s evaporation is 88 W/m2 +/- 8. Mankind’s 2 W/m2 is obviously trivial. One popular GHE theory power flux balance (“Atmospheric Moisture…. Trenberth et. al. 2011 Figure 10) has a spontaneous perpetual loop (333 W/m^2) flowing from cold to hot violating three fundamental thermodynamic laws. (1. Energy out of nowhere, 2) perpetual loop, 3) cold to hot w/o work, 4) doesn’t matter because what’s in the system stays in the system) Physics must be optional for “climate” science. What really counts is the net RF balance at ToA which 7 out of 8 re-analyses concluded was cooling, not warming. 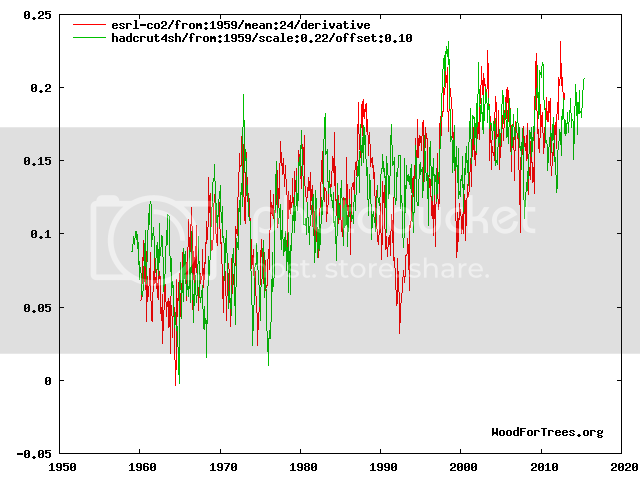 Of course Trenberth says they are wrong because their results are not confirmed by his model’s warming, which hasn’t happened for twenty years. That’s also the plot of Michael Crichton’s State of Fear. Anything I have read on climate modeling (Lindzen as an example) has CO2 effects on a curve–the great dispute is whether the curve is logarithmic or exponential. Assuming a constant effect for CO2 doubling would seem to violate the models. The function is logarithmic. A geometric growth in CO2 yields a linear increase in temperature. Each doubling of CO2 yields the same amount of warming. No expert, but I had been under the perhaps mistaken impression that there is only a limited amount of energy emitted at wavelengths that CO2 blocks. That questions the concept of open ended energy absorption increase as CO2 levels rise. In mathematics it is possible to create any fiction and apply real physical properties. Like you have just done. Doubling atmospheric CO2 and the resulting temperature change in our atmosphere, at best currently is throwing stones in the dark despite the smug assurances of climate modelers. Claiming exponential is simply contrafactual. Willfully ignorant. Any freshman in physics is required to learn that absorption is logarithmic with respect to amount. In the case as absorption at the center of the absorption approaches saturation then the dependence approximates logarithmic due to broadening (the situation in the lower atmosphere). More concentrated tends towards a square root dependence. Phil, absorbance is a logarithmic function of transmission. The amount of heat absorbed is logarithmic, as you can never get to 100% absorption. I’m trying to not confuse people by adding unnecessary detail. The final formula is dT = A ln (C1/C0) where A is a constant dependent on the slope of the line you graphed and entire rest of the system. 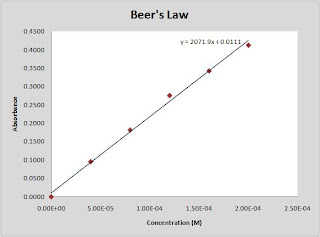 In optically thin systems where Beer’s Law applies it’s linear as shown above. Since when is transmission ‘amount’? Absorbance is a logarithmic function that has no direct physical meaning. It is not a direct measure of the amount of heat that is absorbed. For this reason, it is my opinion that it should NEVER be used for any reason in public discourse to avoid confusion. This is the situation if there is a finite amount of energy or light that can be absorbed. And I confess to hyperbole in my initial post. In summary, there is a rational debate as to the shape of the graph, but that debate is whether it is logarithmic or Arrhenius (it’s generally argued that it is logarithmic for reasons that I can’t remember at this hour, see the “doesn’t hold at high concentrations” quip in the link). Discussing linear or exponential relationships between temperature and concentrations has as much merit as debating the reality of the moon landing! On Venus it snows metal and rains sulphuric acid. Uh huh, all due to an atmosphere that’s 95% CO2 right? Mars has an atmosphere that’s 95% CO2 and it snows dry ice there. Tell me again why RCP 8.5 and CO2 is a catastrophic disaster. Venus is a case of runaway clouds. Without the clouds, the surface would cool owing to the fact that even a 95% CO2 atmosphere at 100 atmospheres is still nearly 50% transparent to LWIR, even more at higher temperatures. Clouds on the other hand are not. But the clouds also reflect a lot of incoming solar radiation. Take them away and the planet gets the full pleasure of direct sunlight — which is, my cocktail napkin once told me, about twice as great at 60,000,000 miles as at the Earth’s 90,000,000 miles. Perhaps you need to learn that % by volume isn’t a good measure of concentration when the pressure isn’t specified. 95% of ‘not very much’ is still ‘not very much’! Mars has a surface pressure of 600Pa compared with Earth at 100kPa and Venus at 9.2 MPa. So the concentration on Venus is over 10,000X that on Mars regardless of the fact that both are ~95% CO2. Not to mention the broadening in each case due to pressure and temperature. So let’s cut to the chase, are you saying that CO2 here on Earth, at 400 ppm and increasing, is a serious problem? We have 0 clues of the geological history of Venus, as a result any guesses are stabs in the dark as a result. This post is complete garbage. Everybdoy should know carbon cioxide is not the only greenhouse gas. That’s why the image from Skeptical Science clearly says “CO2 equiv.” That stands for CO2 equivalent, referring to radiative forcing equivalent to a CO2 level that high. It doesn’t mean anyone actually expects CO2 levels to reach that level. Given the entire basis of this post is on criticizing the idea CO2 levels will reach a height nobody claims they’ll reach, and that RCP 8.5 doesn’t require CO2 levels reach anywhere near that high, this post has no value. It is not only totally wrong, it is embarrassingly wrong because it shows a complete lack of understanding of even the most basic aspects of the subject being discussed. The point of the post is that RCP 8.5 is bad science fiction. “Business as usual” won’t even come close to the 930 ppm of CO2 only. Assuming that the current rate of fossil fuel consumption continues over the next 85 years with the current ratio of oil, gas and coal, it would lead to about 680 ppm. Since natural gas is already replacing coal and we probably can’t quadruple oil production by the end of this century, natural gas is likely to replace a lot of oil too. So, the 680 ppm is probably too high for a “business as usual” scenario. 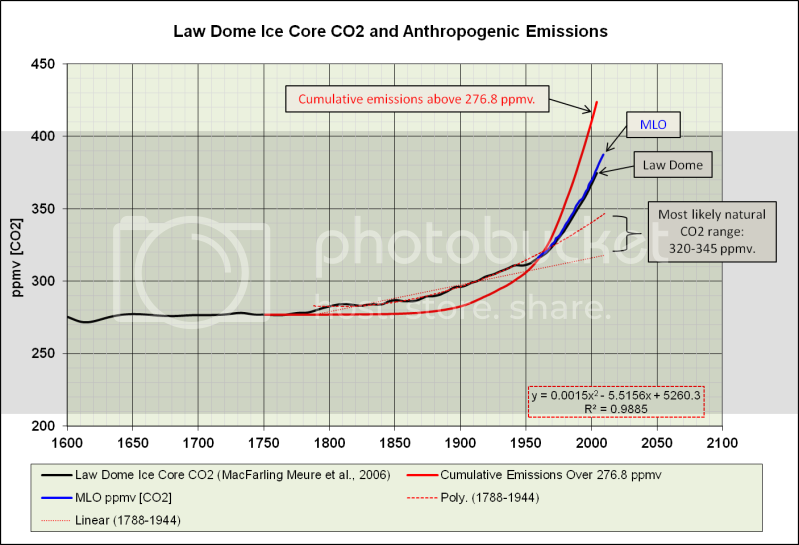 An exponential trend line applied to the MLO data gets you about 560 ppm by 2100. Does any sane person really believe that the atmospheric CO2 concentration could rise from the current 400 ppm to 1,370 ppm over the next 85 years? There isn’t even a hint this is all some elaborate ruse or joke. The fact you placed a post in the “humor” category doesn’t mean people would interpret everything it says as untrue and misleading. That’s certainly not how commenters here have taken it as not a single person before me even hinted at being aware of the issue. Certainly none of them indicated any awareness this was some sort of “tongue-in-cheek” post which intentionally said it’d be impossible to reach levels the IPCC projected that they knew the IPCC didn’t actually project. And if this were some elaborate ruse, what would be the point? This post doesn’t tell us anything. Pointing out atmospheric CO2 won’t reach a level nobody says or predicts it will reach wouldn’t accomplish anything. If this post were all some elaborate ruse, there would be no point to it. It’d be a complete waste of time and space that served no purpose. But come on, this clearly wasn’t an elaborate ruse. You just screwed up in a huge way. Have some integrity and acknoweldge your screw up. So basically you’re arguing the color of the yarn at a sewing circle. Since its pretty clear that CO2 just ain’t cutting the mustard insofar as causing sulphuric acid. rain. Kudos for replying civilly to an uncivil comment. Brandon may have a point but could stand to employ some basic social skills. There’s no excuse for being rude. Let’s hold ourselves to a higher standard please. CO2 “equivalent” contains all of the GHGs, CH4, CO2, etc. and their collective warming relative to CO2. But our entire life-style is not being changed based on “CO2 equiv” – it’s being changed based on CARBON! WTF is that, Brandon (and SkS)? Mr. Shollenberger has a valid point… embedded in a few paragraphs of vitriol. See IPCC AR5 Figure 6.1 and Table 6.1. Basically treat RCP 8.5 as unlikely (in IPCC parlance). Emphasis didn’t work. I was drawing attention to “comparatively high”. RCP 8.5 and the A2r scenario sound like a world in which economic growth remains robust… I’d rather have a robust economy, so we can afford to adapt to whatever the climate does… Rather than a bankrupt economy and be at the mercy of whatever the climate does. RCP 8.5 goes well beyond robust. It is as the man says a selection of the 75% extreme elements that will drive GHG emissions. I’d look to RCP 6.0 or 4.5 for robust BAU growth. I don’t know if the author misread the IPCC data or just repeated an error from Skeptical Science. 1.7 C just from the DIRECT effect of CO2. The question then is would be the TOTAL effect after all feedbacks. Curry’s latest paper posits a factor of 1.7; so a total of 2.94 C.
Most alarmists zero in on the middle of the range from the Charney Report (1.5 t0 4.5); i.e. a factor of 3.0. This gives you a result of 4.9 C as a result of the 930 PPM. So, regardless of what CO2 concentration you assume for 2100, the biggest question is that of CO2 sensitivity; probably the most important scientific debate going on today. See the addendum and my reply to Mr. Shollenberger. The ECS/TCR is also grossly overestimated by the alarmists. metric in all of climate science. The sum total of the best science puts the figure for ECS between 1.5C and 4,5C per doubling. But skeptics KNOW better.. haha settled science from skeptics..
Only BAD skeptics insist that they know differently. Typically they dont have any science to back up their claim that ECS lies outside this range. or they rely on the ‘one paper’ syndrome. as if one paper or one analysis could settled the issue. The best science says between 1.5 and 4.5. No observation-based science puts it much above 2 K. Most put it in the range of 1.5 to 2 K.
So, any models assuming 3 to 4.5 C are grossly over-estimated. Does it not bother you that Planet Earth is decisively falsifying the climate alarmists’ belief system? Who should we listen to? The climate alarmist contingent? Because only one of them is right. But then you hand-wave an opinion as fact. Yes, yes I believe you though thousands wouldn’t. I feel your pain and frustration. The best “science”… “decades of work” all continuously over turned by a climate that simply refuses to follow the script. The best of agw climate science, reduced to the role of monkeys, forever pounding on a typewriter never to produce that elusive Shakespeare play. Cheer up. You can still go skiing, just about all of the slopes nationwide are still open for business . Kind of puts that 1.5C and 4.5C into perspective. Go show some of them your pretty picture and tell them its warming. this just touches the tip of the iceberg of what has been going on during these warmest months ever. Learn something Toneb.. look out the window. It’s called “weather” my friend. Would you like me to list a series of heat anomalies? Around the globe? Oh, and snow in Central Asia does not equate to colder than average as Central Asian is normally dry/cold. Snow requires WV content which increases with warmth. 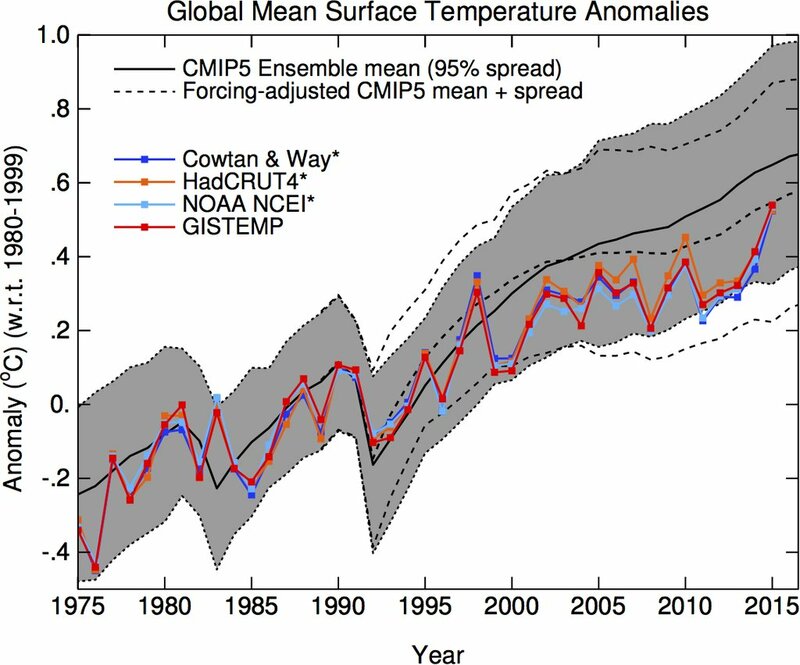 Thing is my friend, that is a graph produced by the world’s experts in climate showing the state of affairs of AR5 cmip5 runs with real world forcings applied now that they are known. And where are we? Just about smack on the median. So are you resorting to conspiracy On behalf of IPCC scientific contributors? If so, then splendid, you are beyond logical reach. Just More hand-waving from inside the rabbit hole. Convincing only yourself and the cheering denizens. Learn something, Toneb. Put ‘cowtan and way’ into the search box. You will find ample evidence that debunks their paper. This is assuming that Henry’s Law is permanently suspended by whatever thing they invented to replace it. Is Cooling to next Glaciation avoidable? enough coal and natural gas in the ground to make it to 2100 without us having to freeze in the dark. Geological evidence shows periodic glaciations with SHORT interglacials. Our climate has been cooling since the Holocene climatic optimum. Can we generate enough global warming to avoid descending into another glacial period? I hope so… But I doubt it. That Existential crisis will concentrate minds, inventors and engineers! Not a hope, and worse still, such is our understanding (when we cant even say why El Nino’s happen) for example, that our meddling might have an opposite effect. The arrogance of claiming to understand it all is ludicrous, but then again, the human intellect likes to make up convoluted over complicated constructions to feed said intellect. Yeah, it’s even less so, because CO2 in the atmosphere is not dependent primarily on fossil fuel emissions. These are children frightened of monsters under the bed. About half of the rise from 280 to 400 ppm is due to fossil fuel burning. 60 ppm is anthropogenic… 340 is natural. It will become undeniable when temperatures start decreasing on the downside of the ~65 year cycle. Emissions will keep accelerating, while atmospheric CO2 decelerates, and the divergence will become large. Until you know the amount of CO² being returned to the atmosphere by ALL contributors you have no idea what man’s additive contribution is. About half of it has to be from us. While the anthropogenic contribution to the carbon budget is very small. It does have a cumulative effect. We are taking carbon out of geologic sequestration and putting it back into the active cycle. Anthropogenic CO2 is 1/3rd land use changes and 2/3rds fossil fuel and cement. IPCC AR5 partitioned 1750 to 2011 anthropogenic CO2 57% sequestered by magic unicorn spontaneous sinks with 43% remaining in the atmosphere to conveniently and coincidentally make the numbers work. What is referred to in college chemistry as dry labbing the results. Excuse me … do you have any science to back up that assertion. And approaching the question logically how can natural CO2 sources outway natural sinks currently ? That is what has happened to that may have caused this? Are “natural” sources” spewing out more CO2? Are natural sinks sinking less? I am not aware of a temp increase that might cause greater atmos CO2 outgassing … after all this is WUWT. Please link to any science that says otherwise. There is no physical requirement for this. At a tiny fraction of natural flows, which are rapidly incorporated into them. It’s not a question of how, it’s a question of why. The observation is that the rate of change of CO2 is proportional to appropriately baselined temperature anomaly. Of this, there is no doubt. If you give me the temperature profile over any interval within the years since accurate CO2 measurements became available, I can tell you how much atmospheric CO2 changed within that interval to a high degree of accuracy. Human inputs are not needed for this calculation, and adding a significant proportion of them in drives the estimate too high. “Are “natural” sources” spewing out more CO2? It is my belief that it is mostly the latter. With a temperature rise, less CO2 downwells with the THC – unsurprisingly, the thermohaline circulation is modulated by temperature. Hence the name. As the THC is a continuous transport process, this begets a change in the rate at which CO2 accumulates in the surface oceans, and hence to the atmosphere. This, or some other temperature depending rate process, is what the data are telling us is happening. There is no doubt about it. The odds of this relationship occurring by pure happenstance are infinitesimal. As I say, all this will become undeniable in the near future when temperatures decline in the normal ~65 year cycle. Stay tuned. If CO2 gets that high plants will be working overtime and produce huge amounts of oxygen. When O2 increases high enough we’ll get giant insects, how exciting! Well they will first have to makeup for the backlog, since over at least the last 20 years O2 has been removed from the atmosphere faster than CO2 has been added. This Pentagon climate report speaks to the heart of false climate science alarmism that is rampant to day .These alarmist climate science reports are meant to exaggerate and scare people. I have not checked and read the comments thus far, and I must confess I have not properly gone through the post itself…..so please do forgive me if I am raising a point already just made and dealt with. But just in case, and in the prospect that I am not arguing at this point in the bases of misinformation, but as this one post deals with climate models and in specific with one of these models, the IPCC RCP.8.5. So, please,if I have got some thing wrong in principle, or the info is no so correct in regard of the mentioned “climate” model, please do correct me. So, as far as I know and I can tell, the mentioned model is actually what can be considered as a “hybrid” modeling, where the GCM modeling and its simulation is married to another kind of computer game, an AGW heavy weight “climate” modeling…….where the result of that model are gained out of a computer game AGW heavy model due to an input data to it from a GCM simulation based in a “business as usual” scenario……. That is what that one in particular stands and is when considered as for a climate model. But as we are at the IPCC and therefor the main official “climate” modeling, there is one more point I would like to make……..when it comes to GCM simulations as per “business as usual scenarios”. How can the end result, or any other data about the simulation any given time under the consideration regarding the CO2 concentration trend will mean anything at all unless considered in the aspect of its depending in the actual relation of yearly sinks and yearly emissions, and the actual difference in between these two! If that will show a whole or almost human effect why that info still missing? Why the information that will put every one’s mind at peace about what is the share and the effect of human emissions on the actual concentration trend, as per the GCM simulation, is missing, when in the same time, as far as I know it is claimed that the “business as usual” GCM scenarios have a very good depiction of that trend. How this could be, why the main piece of the info is missing……and in contrary to it we end up considering silly obfuscated scenarios as due to some weird “hybrid” nonsensical simulations, like the 8.5 one, which in the end actually means nothing more than playing a very heavy AGW computer game…..and considering the result of such a silly computer game as realistic……. But energy also leaves the planet at an increasing rate when there is more surface warming,far more than what CO2 is postulated in generating. The question we should be asking is where is all that additional energy coming from? with that in mind you can see why wild claims are made . To be fair , many working in this area have such low scientific ability , along with low levels of personal honour and massive ego’s , that even if they wanted to they could not support their arguments on the basis of facts. David Middleton, thank you for your short, focused essay. You will. In the 34 years between 1980 and 2013 average annual increase of known crude oil reserves was 2.61%, while production only increased by 1.05% per year. The net result is, in 1980 proven reserves were enough for 29 years at constant rate of production, while in 2013 they covered twice that much time, 59 years. Not the kind of behavior one would expect from a resource on the brink of final depletion. Even under Hubbert’s 1956 assumptions, crude oil wouldn’t be “on the brink of final depletion.” Peak resource production generally occurs around the mid-point of the depletion of that resource. problem is: such belives are inherent in midst of society. midst of society tries to stay sane by adhering to such believes. After reversing back the global average temperature curve and from this removing the other components other than anthropogenic greenhouse gases that contributing to global average temperature rise, what will be the real temperature rise at global level — although global average is a misnomer & hypothetical in nature as this factor is not going to affect nature but the localized change only affect it. CO2 & anthropogenic greenhouse gases — there are several other sources other than fossil fuel use. Prior to 60s we have practically no measurements of greenhouse gases around the world. Yet, with all this the so called global warming is less than 0.15 oC by 2100. Details of the RCP 8.5 scenario can be found at this link. Annual CO2 and CH4 emissions will plateau in 2070 at triple today’s level. Despite burning all that coal, sulfate aerosol emissions will drop by 75%. Thanks. I may gin up a sequel to this post. So…RCP 8.5 is even worse bad science fiction than previously believed. I see the CO2-equivalent issue has been addressed. But also consider yourself making this calculation in 1916. You would draw a linear trend line through fossil fuel emissions from 1865-2014 and project that linear growth into the future, finding a year-2015 concentration of about 340ppm. You would conclude with the question: “Does any sane person really believe that CO2 will reach 400ppm by 2015?”. That apparently wouldn’t have been a controversial view at the time. From what I understand Arrhenius initially believed it would take millennia to double atmospheric CO2. Linear growth calibrated to the period 1965-2014 is a plausible assumption. It’s actually pretty close to what happens in RCP6.0, the low-end “Business-as-usual” scenario, which reaches 670ppm in 2100. But an increasing growth rate is also plausible – it’s been the norm in the historical record to date. The scenarios are calibrated to a historical emissions inventory and diverge from 2005. Going on from 2005 the same emissions inventory is so far showing growth tracking slightly above RCP8.5, way above RCP6.0. Early days obviously, but no sign that 8.5 is insane from a demand perspective at least. The problem is that fossil fuel consumption cannot follow the growth rate required by RCP 8.5 very far into the future. It can’t even follow RCP 6.0 very far into the future. The problem is that fossil fuel consumption cannot follow the growth rate required by RCP 8.5 very far into the future. Cannot? There’s certainly enough material to burn. It’s a question of whether it can be extracted economically, which is a function of technology, economics and will. It seems absolutely plausible that the demand is going to be there, absent policy changes. Re: your natural CO2 analysis. Firstly, your training period of 1788 to 1944 substantially overlaps the industrial era (historians would argue it’s entirely within the industrial era – 1760 is commonly considered the start date), so claiming it as a pre-industrial trajectory is clearly wrong. Why not train it using 1000-1760CE? 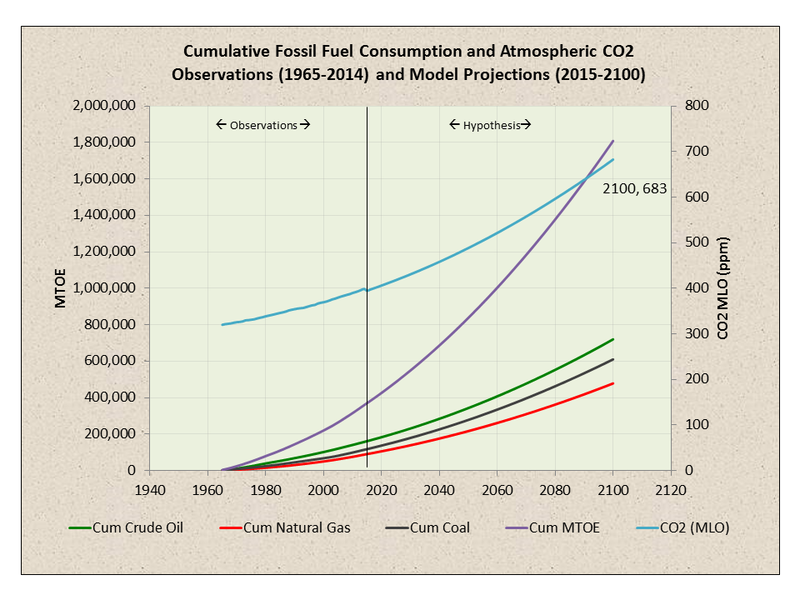 Secondly, it looks like your cumulative emissions curve is fossil fuel-only. In the early-industrial era land-use change was by far the largest source of anthropogenic CO2 emissions. At 1850 land use change emissions were plausibly about 10x that from fossil fuel sources, bigger multiples prior to that, and it was only around the 1930s-60s that fossil fuels took over as the larger source. Crude oil production simply can’t keep up with RCP 8.5. While it may not actually reach “peak oil” for a long time, the growth rate can only decelerate. The Hubbert Equation is actually valid. His estimate of recoverable resources was wrong. Natural gas and coal may be able keep up with RCP 8.5. However, gas is steadily displacing oil and coal, largely due to economics. So, the emissions projection in RCP 8.5 is not even remotely realistic as a “business as usual” scenario. Yet, it is the basis of almost every catastrophic forecast of what is expected to happen if we don’t drastically reduce emissions. Prior to 1960, atmospheric CO2 was rising faster than emissions. I suppose that could be a function of land use changes. Can any sane person really believe Armageddon will occur when atmospheric CO2 reaches 900 ppm at some unknown year in the future, when atmospheric CO2 was at least 5,000 ppm in the past (and helped create the oxygen based world we live in). Yes, alarmism sells magazines, papers, votes, funding but c’mon folks, take a deep breath and get back to reality.